These burgers rival any Bunsen or Wow Burger - really! 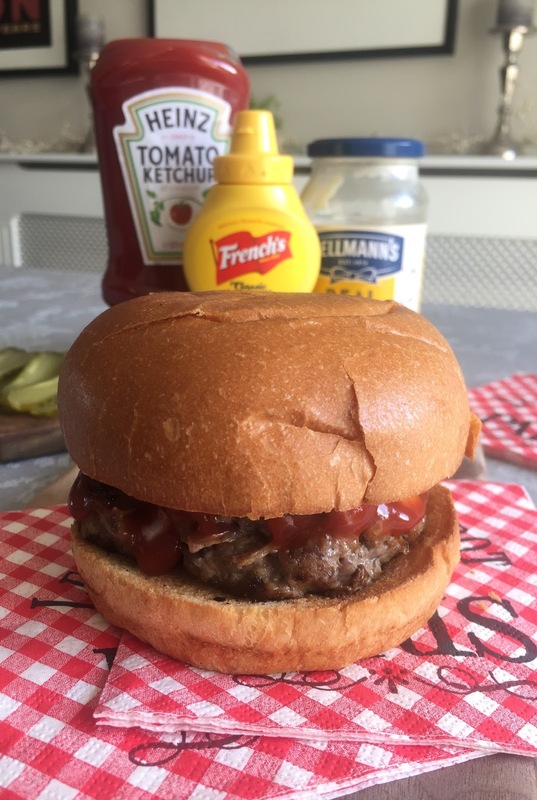 This recipe is from Annabel Karmel - the baby food guru - so for a burger recipe it comes from a slightly unusual source. But I've learnt over the years that sometimes the most delicious recipes appear in extraordinary places. I've been making these since Ross was a toddler and have never ever found a tastier burger recipe. Finally, after at least ten years of making and eating these I feel I've perfected the toppings and the bun. If you follow exactly, to the last drop of ketchup, you will be rewarded with one of the best burgers you will ever eat. Mix the chopped onion, chopped parsley, grated apple, Worcestershire sauce, brown sugar, stock cube mixed with water, and salt and pepper in a large bowl. Add the mince and mix until all ingredients are combined. Place in the fridge and chill for at least two hours. Using your hands make six burgers from the mixture and chill for a further 10 mins so they hold their shape when cooking. In a large pan heat two tablespoons of olive oil over a medium/high heat. Don't overcrowd the pan, fry 3 or 4 burgers at a time for 5 - 10 minutes until well browned, then turn over. Cook for a further 5 minutes until cooked through. Next the brioche buns.. Toast 'lightly' (very important!) under the grill for a couple of minutes - don't overcook, and keep a good eye on them so they do not burn! Then spread one side with Hellmann's mayonnaise, on top of this squirt Heinz tomato ketchup and French's classic yellow mustard. Mature white cheddar (melt on the cooked burger in the pan), rocket, tomato and sweet onion relish.